Home > Does a Hipshot Xtender fit on a Warwick bass? You have a Warwick. You want to fit a bass detuner. Is there one that will work with your bass? Yes, there is, but it isn’t perfect. 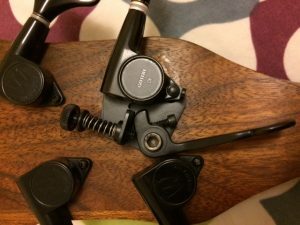 Warwick basses generally use the GOTOH GB707 Machine Head or similar which is perfect – the Hipshot GB7 Xtender is just a GB707 fitted to one of Hipshot’s swivel plates so it’s direct replacement! No issues there then. Similar to many Ibanez basses, the Warwicks have a very small headstock. This, coupled with the angled-back mounting of the machine heads, make fitting a GB7 a little tricky. Despite the awkward angle and lack of space, there is just about enough room for the GB7’s base plate. Not ideal but at least it works. But here’s the problem; the lack of room means that the lever (used to drop your tuning down) does not have enough room to move freely. 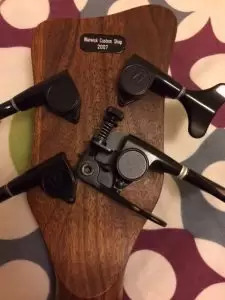 Now, what I have found, with this and other customer installations, is that this isn’t necessarily an issue – although the lever is pointing down the neck, it does keep well out of the way of the fretting hand. But, with some many different techniques and style of playing, I’m sure that for some this could be a problem. This does also mean that there is no chance of using a Doublestop lever, as we discovered with the installation above. Dropping down to D is fine but dropping down another step will not work – the lever can only go so far before hitting the G machine head. This is simply a heads up for those of you who want to fit an Xtender to a Warwick bass. Thanks to Roger for the photos!